Toshiba Dynabook R631 is a stylish laptop which is now available inJapanfor 150,000 Yen (around $1,920). It is packed with a 1.6GHz Intel Core i5-2467M processor and Windows 7 Home Premium 64-bit (SP1) OS .It is a light weight device so you will never feel it difficult to carry it with you wherever you desire. It is claimed by Toshiba that it is the World lightweight ultrabook which has the weight around 1.12kg. Toshiba Dynabook R631 is featured with a , a 13.3-inch LED-backlit display with resolution of 1366 x 768 pixels, and an Intel HD 3000 integrated graphics. You will be able to watch the clear view of videos and images. The graphics of it are real time and you hardly found a difference. For enhancing the security level, it comes with fingerprint reader. 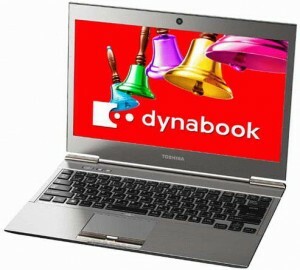 Toshiba Dynabook R631 is combined with a 4GB of DDR3 RAM, 128GB SSD, a SD memory card slot, , and a 1.3-megapixel webcam. For fast speed connectivity it brings Wi-Fi 802.11b/g/n, WiMAX and external connections can be made via D-Sub or HDMI, and USB 3.0 port. The battery of this laptop let you to operate it up to 9 hours of operation. The measured dimensions of Dynabook R631 are 316 x 227 x 8.3-15.9 mm. Do you believe that it is the World light weight laptop? Is it stylish?